A Tachytes species feeding, copyright Stephen Cresswell. Most people who are not entomologists assume that 'ants', 'bees' and 'wasps' are all mutually exclusive groups of animals. 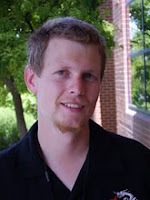 But while bees and ants are distinct from each other, they are both really distinctive subgroups of wasps. It is not difficult to find guides on the interwebs purporting to tell you the differences between a bee and a 'wasp', but many of the points usually cited will not apply to all wasps (usually what is intended is the differences between a bee and a social wasp, which is the type of non-bee, non-ant wasp most likely to make itself known to humans). Some wasps can look very similar to bees indeed. 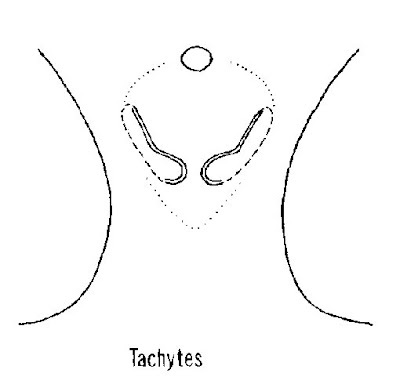 Diagram of Tachytes ocelli, from here. Tachytes is a large, cosmopolitan genus of not-quite-bees, including more than 250 species found on all continents except Antarctica. Its members are robust and hairy, and one would have to look very closely to spot the features marking it as a non-bee (such as the point that its hairs, though numerous, are not branched in the manner of a true bee). 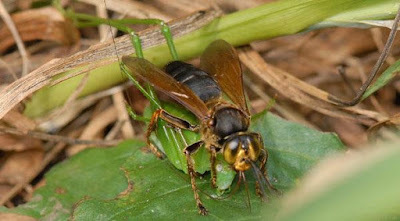 Tachytes is classified in the Crabronidae, the family of wasps believed to be most closely related to true bees (other crabronids have been featured in earlier posts: here, here and here). Like other crabronids, adult Tachytes are pollinators, feeding on nectar from flowers. Tachytes species can be separated from most other crabronids by the shape of the ocelli. As well as the two large compound eyes with their multiple lenses on either side of the head, many insects have three small single-lens eyes, called the ocelli, on the top of the head (some insects have fewer or no ocelli). When all three ocelli are present, they are arranged in a triangle with one at the front and two at the rear. In Tachytes, the rear ocelli are present but deformed (I presume non-functional, though I don't actually know). They are reduced to a pair of scar-lines shaped roughly like a comma, or the upper part of a question mark without the dot. Female Tachytes sinensis sinensis with katydid prey, from here. Like many other wasps, female Tachytes dig burrows in which they they sequester other insects in a paralysed state to provide food for their young (the big change between bees and other wasps was the provision of their larvae with a plant-derived food source such as honey or pollen instead of animal matter). The size of the burrow varies from species to species, but some are quite extensive: the North American species T. praedator digs a burrow with a centimetre-wide entrance about a metre long, with a 70 cm down-shaft followed by a horizontal run of about a foot (Lin 1967). This species digs at night, thus presumably both avoiding the heat of the day and reducing the risk of detection by predators or parasites. The top of the burrow is usually marked by a heap comprised of the removed soil from its digging; in some species, the female will close over the top of the burrow when not actively digging. A series of cells are constructed branching from the end section of the burrow; each of these cells is filled with enough prey to feed one larva, then an egg is laid in the cell and its entrance sealed. Most Tachytes species feed their larvae with Orthoptera such as crickets, grasshoppers or katydids; the exact type preferred differs between species, though I get the impression of a general correlation between the size of the Tachytes species and the size of its preferred prey. At least two exceptional Tachytes species from central Asia (T. ambidens and T. bidens) are known to supply their larvae with small caterpillars rather than orthopterans. The prey is carried by the female held by her legs, with the antennae clasped by the mandibles. Hunting behaviour has been described for two species from North America, T. intermedius and T. mergus, that stock their nest with pygmy mole crickets (Tridactylidae). Females of these species walk along the ground tapping at it with their antennae. When one locates a cricket in its underground burrow, she quickly digs downwards in an attempt to grab the cricket by its head with her mandibles and haul it out. Even if the cricket hears her coming and attempts to flee from its burrow, it may not escape. The wasp moves so quickly that she is often able to grab the cricket in mid-air as it leaps for freedom. These two Tachytes species also differ from others in the genus in that the crickets are sequestered in the nest not fully paralysed: it has been noted that mole crickets recovered from their nests are still quite mobile and even able to jump. Lin, C. S. 1967. 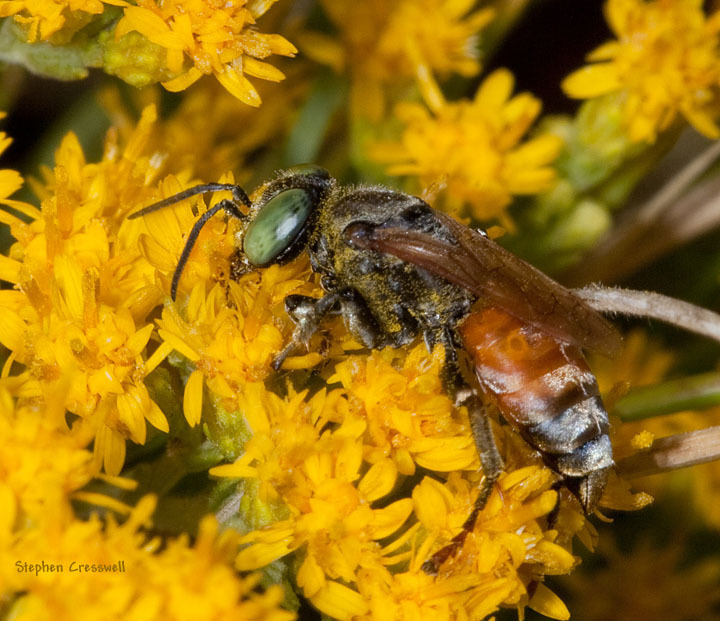 Nesting behavior of Tachytes (Tachyplena) praedator Fox, with a review of the biology of the genus (Hymenoptera: Sphecidae: Larrinae). American Midland Naturalist 77 (1): 241–245. If the mole crickets are not fully paralysed when they are sequestered, what prevents them from digging their way out of the cell? What are ocelli good for? What do they do that the regular eyes can't? Christopher: I was wondering the same thing. I don't know if it has ever been proven specifically in these Tachytes species, but some caching wasps apply their venoms locally only. 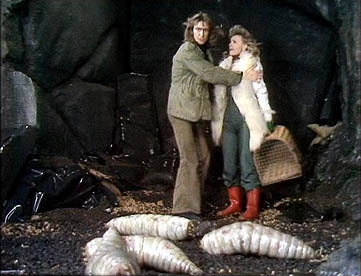 Some mantis-hunting crabronids, for instance, will specifically sting the mantis' raptorial forelegs to disable them while leaving the other legs functional. Maybe the tridactylid-hunting Tachytes only paralyse the mole cricket's digging forelegs. Andreas: The ocelli (which lack the capacity to form an image) can detect light distribution faster and/or more efficiently than the image-forming compound eyes (I'm guessing it's a bit like the different optimals of rods vs cones in our own eyes). Among the suggested ways in which this may come in useful is that the ocelli may play a role in orientation during flight. I enjoy almost all of your posts, but this was especially tantalizing. Predators of orthopterans--so cool!